Wanted to post one quick picture from Alley's grad on Friday. I am soooo proud of her, graduating with distinction and off to teacher's college in the fall. 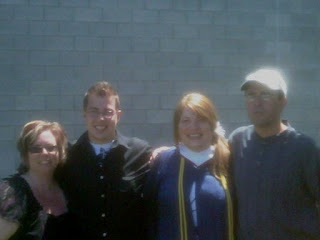 Donna (me), Josh (Alley's brother / my cousin), Alley (the grad) and Chad (my brother). Not sure that it's fair I am the oldest...and clearly the shortest??? I have no idea when Josh got so tall!